HeyPlantMan! 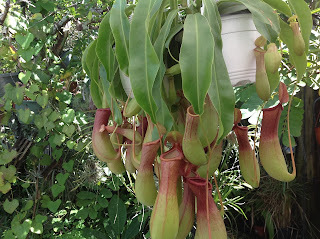 Exotic Tropical Plants from St. Pete FL: Shark Week ! 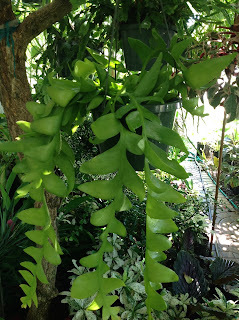 That is, Shark Toothed Epiphyllum and More ! Shark Week ! That is, Shark Toothed Epiphyllum and More ! Greetings, it's Sharks Week at Armstrong Nursery - and we have a very cool hanging cactus that we affectionately call "Shark's Tooth Cactus", which is Epiphyllum chrysocardium. This night-blooming beauty produces a large, fragrant white flower with gold filaments. The foliage reminds us of the color "apple green", and if you look closely, the leaves are shaped just like Shark's Teeth ! 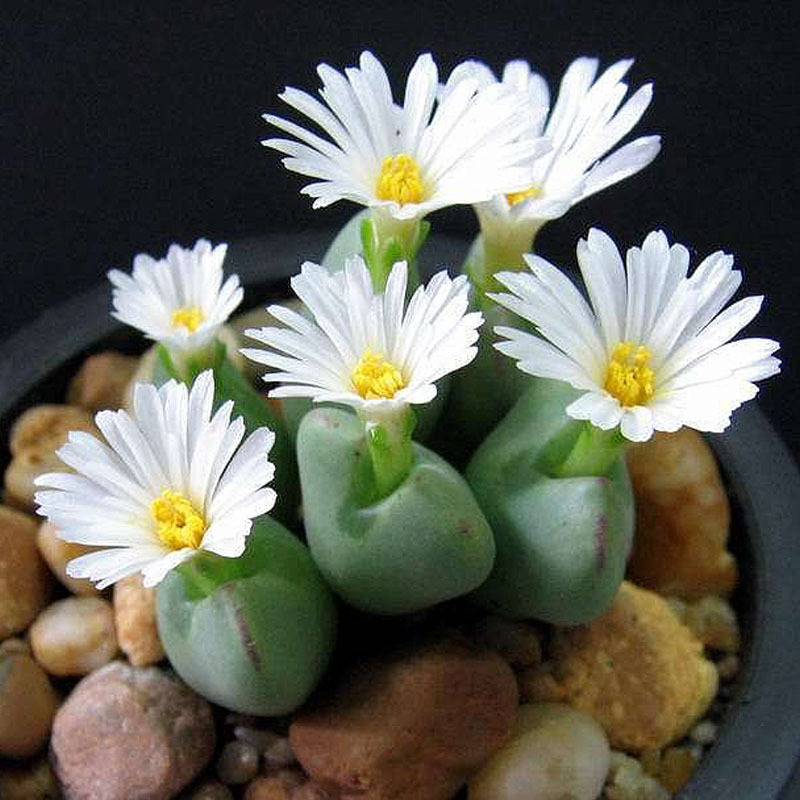 Slow growing, but easy to care for, it likes bright, indirect light, minimal water and can grow to lengths of 3 feet. The leaves are quite smooth and it makes a stunning addition as the leaves cascade down in a zig-zag fashion. Also, this week, we have some new beauties in the Succulent and Cacti world - Mini world that is - we are all stocked up on fresh and new Mini Succulents and Cacti, many of which you haven't seen before. 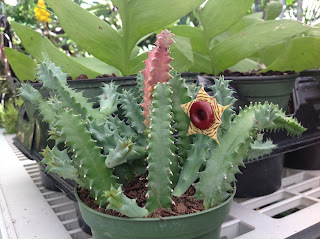 We are always amazed how such tiny plants can product a large gorgeous flower. 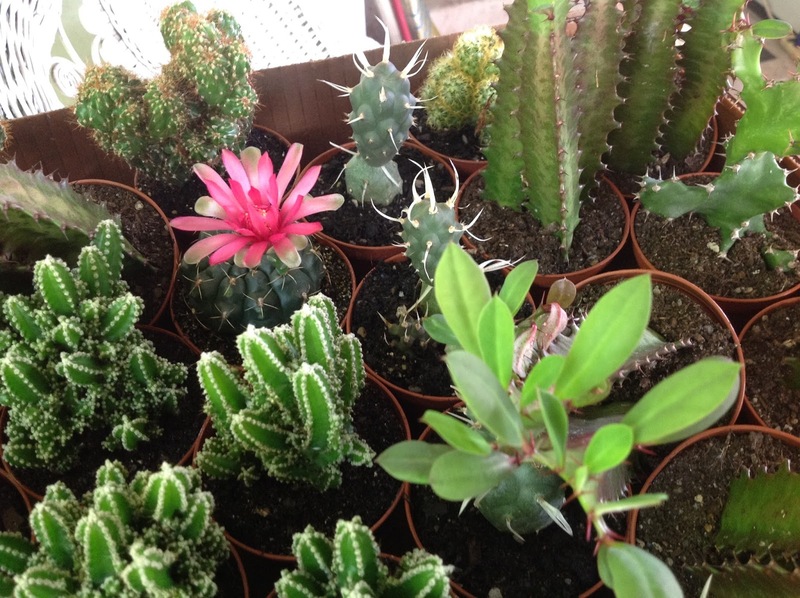 The "Life Saver" cactus at left is one of our most popular. And new this week, that we have not had for quite a while, are our "Living Stone" or "Lythops"
These unusual plants are from Africa and yes, they do resemble a "stone", but yes, they are living plants, produces white, yellow and pink flowers. 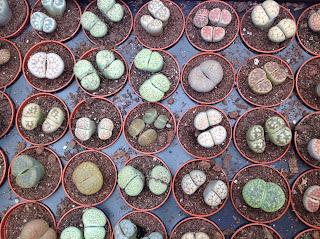 What's great about them is that they need very little watering - only once every month or so. We also have some new 2 inch ceramic pots in rainbow colors, that these plants will fit into perfectly. 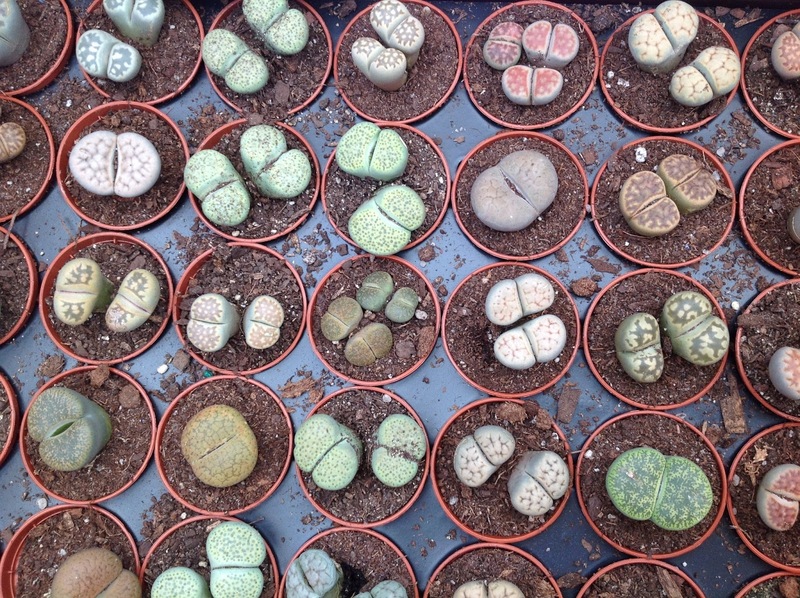 Great for a window sill or patio, they also make an unusual and thoughtful gift for the gardeners in your life. 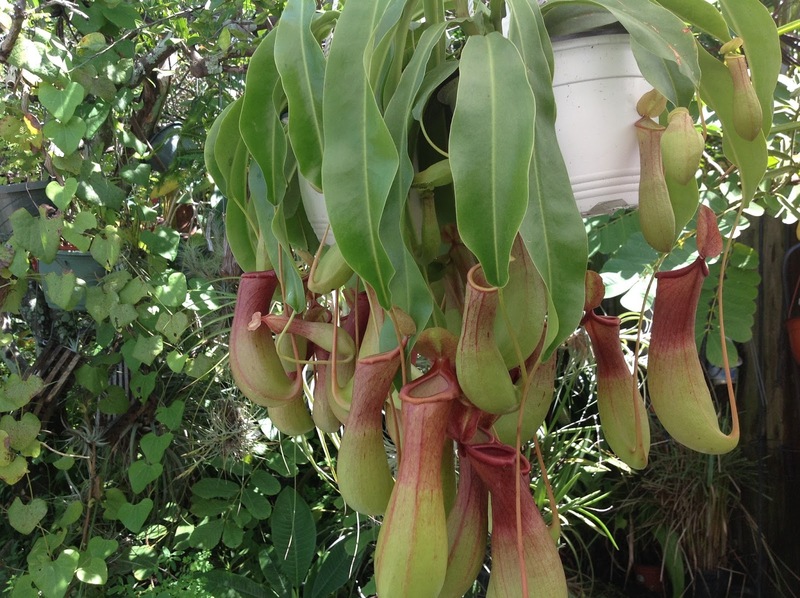 Our "Pitcher" plants aka Nepenthes alata are continuing to bloom like mad. A great conversation starter in the garden, hang in your porch or shady spot in your garden and spritz with the hose once a week. 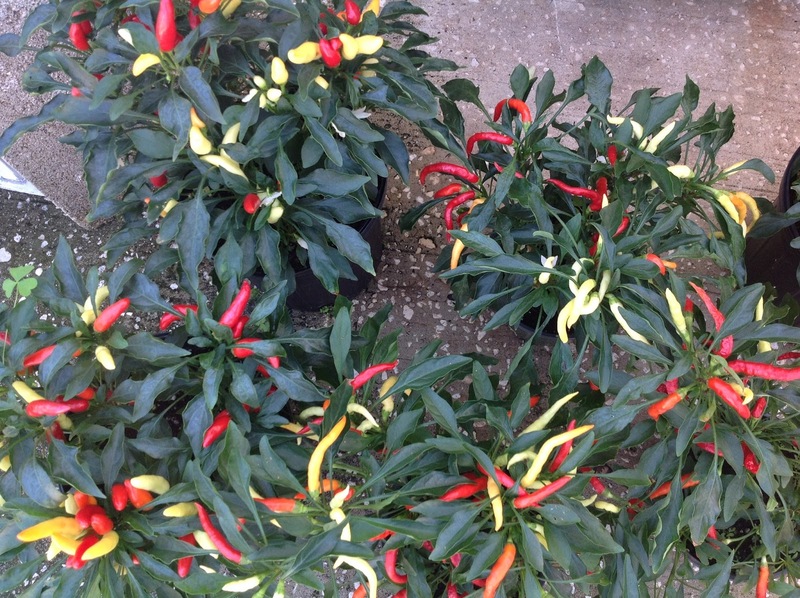 Of course, Mitch loves his peppers and these are mad-producing beauties ! Want some spice in your life? These will do - Colorful, hot and tasty, perfect using as is, or make your own salsa. We are getting down to the last of the current crop of Butterfly Wing Plant, so you better hurry! The next crop is due hopefully in a couple of weeks. Our Red Button "French Kiss" Gingers continue to be very popular with everyone and they are blooming like mad, and they don't seem bothered a bit by our heat and humidity, they are thriving ! Remember, there are only 3 more Saturdays for Williams Park Summer Market - our last day of Summer Market will be Saturday, Aug. 27. The market then closes for the month of September, and will reopen for the new season, back at Al Lang Field, on Sat. Oct. 1st. 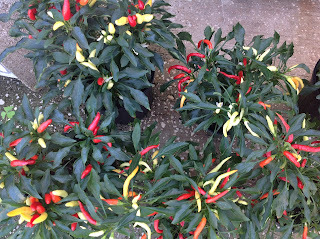 But, you don't have to miss us in September - we will be around for the most part of September, so feel free to call or email for an appointment to check out and purchase plants at our private nursery here in St. Pete. We appreciate your continuing support during this time when we have no markets or shows to bring our product to! The park is bordered by 3rd & 4th Streets North, between 1st and 2nd Avenue North - Market Hours 9am-1pm - plenty of on-street parking all around. Look for us in the Northeast Corner of the Market under the shady Oaks. We have an easy pick up area on that corner for you to drive up and get your purchases. We are also happy to provide delivery to the local area of Downtown, Southeast and Northeast St. Pete.